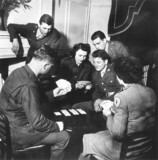 Soldiers and welfare girls playing cards, World War Two, 1942. 'Jellallabad [sic] - Scenes in Camp', 1879. Soldiers in a pub, Second World War, c 1939-1945. 'Dig for Victory' poster, c 1940. Design for a helicopter and tank, c 1490s. Bombs lighting the night sky over London, 22 March 1944. Child evacuees depart, 14 December 1939. 'Ex President Kruger's Home at Pretoria, South Africa', 1901. 'Window Protection Against Blast', Wills cigarette card, 1938. Women refugees, Russia, Secod World War, February 1943.